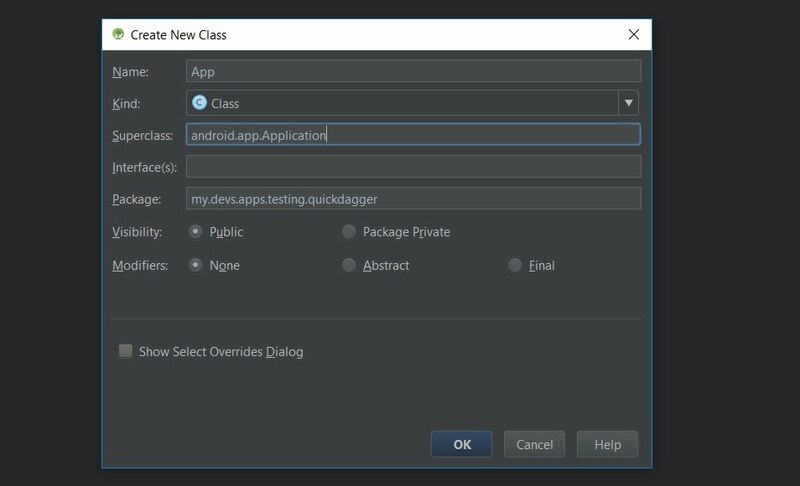 Android and Dagger 2 in 5 minutes! 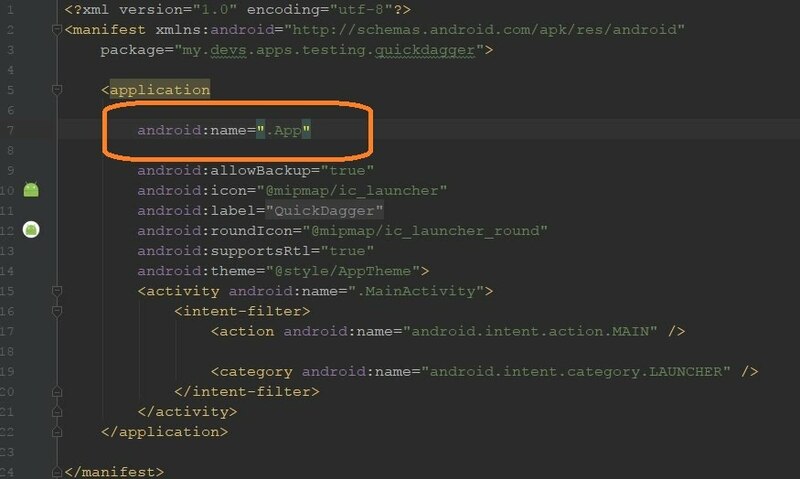 2.1 Use Android Studio to create a new project. 2.2 Add Dagger 2 dependency to gradle app module. 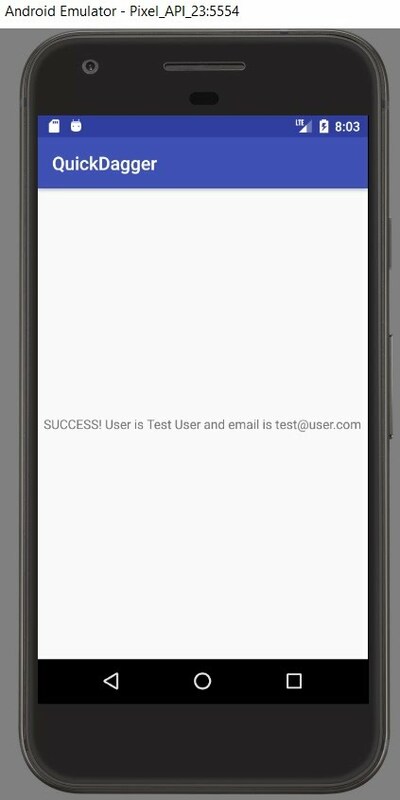 2.6 Create a TestService Class and Inject it to MainActivity for testing. 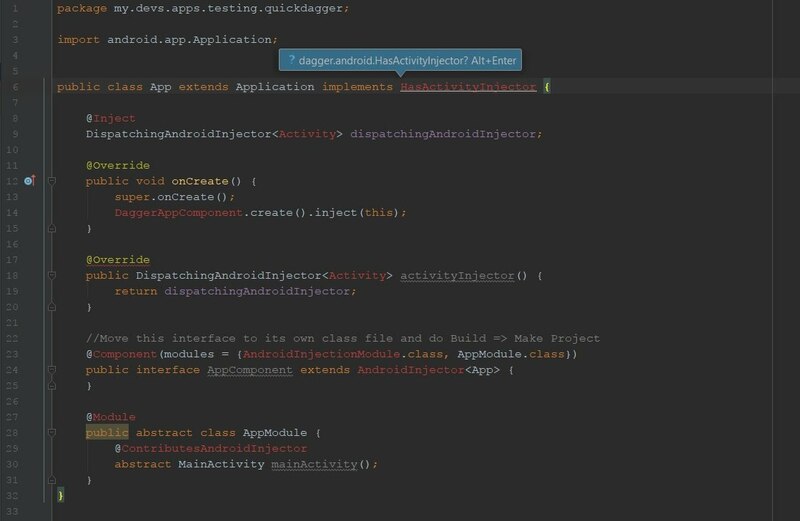 Dagger 2 for Android can be unnecessarily complicated. 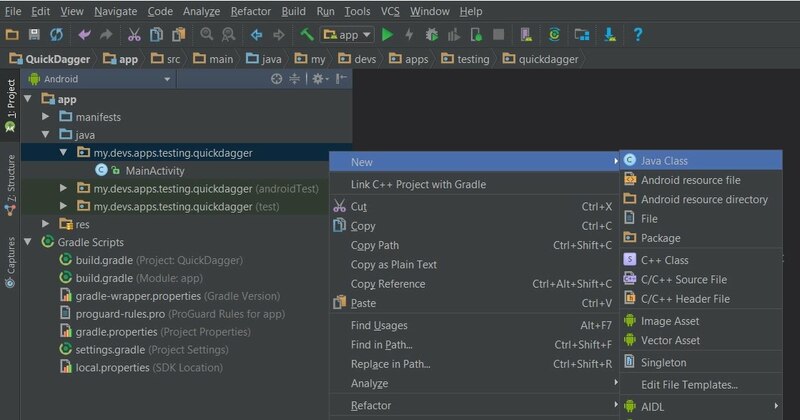 Here is a tutorial for simplified usage of Dagger 2 as well as adding "quickstart" code as Android Studio Live Template. 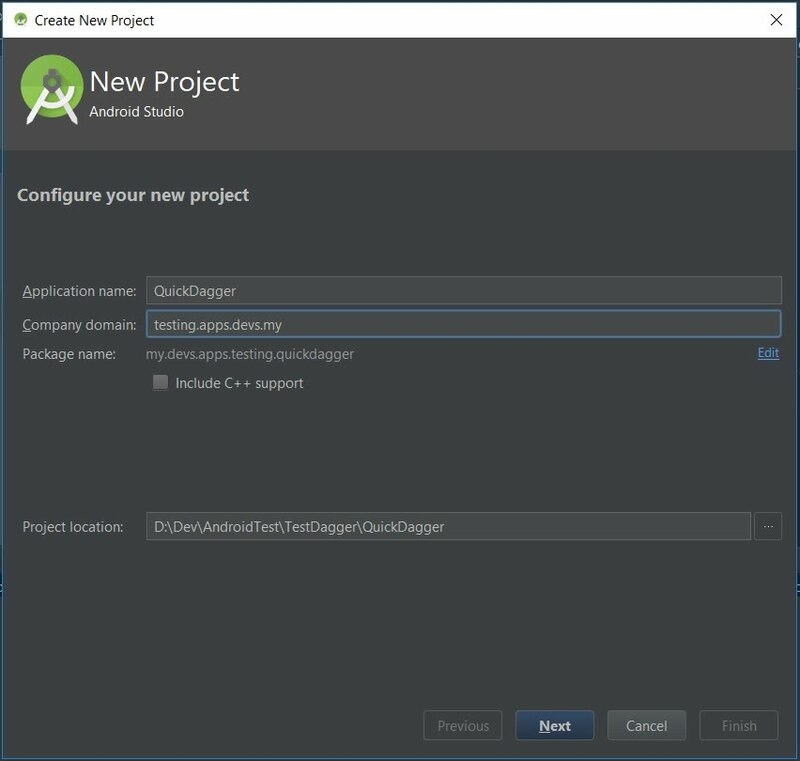 Use Android Studio to create a new project. Just click next and accept all the default option. Just make sure that it targets phone and tablet and MainActivity class is created by the wizard. 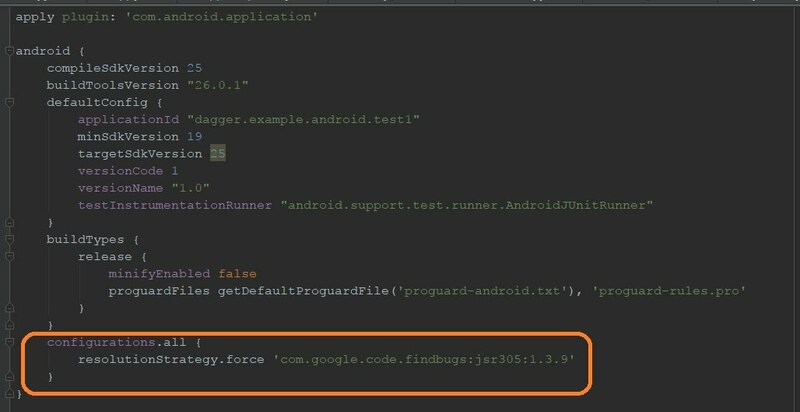 Add Dagger 2 dependency to gradle app module. Add the following code as per above picture. These codes might not bee needed so feel free to try without it. And the needed dependency as per bellow picture. Use bellow codes to copy paste. Select "user" and add a new user Live Template as per bellow image. Set Abbreviation to something easily remembered. This example use "DA" as the shortcut, so that you can type DA and press TAB key to generate the code. Use bellow code as the template by copy and paste into Template text. Add a class that extend Application class. This can be done by right clicking the application package and use context menu to add a new Java class. Refer to bellow pictures. Name the class App and superclass to be android.app.Application. Set the class as application class for the project app module. 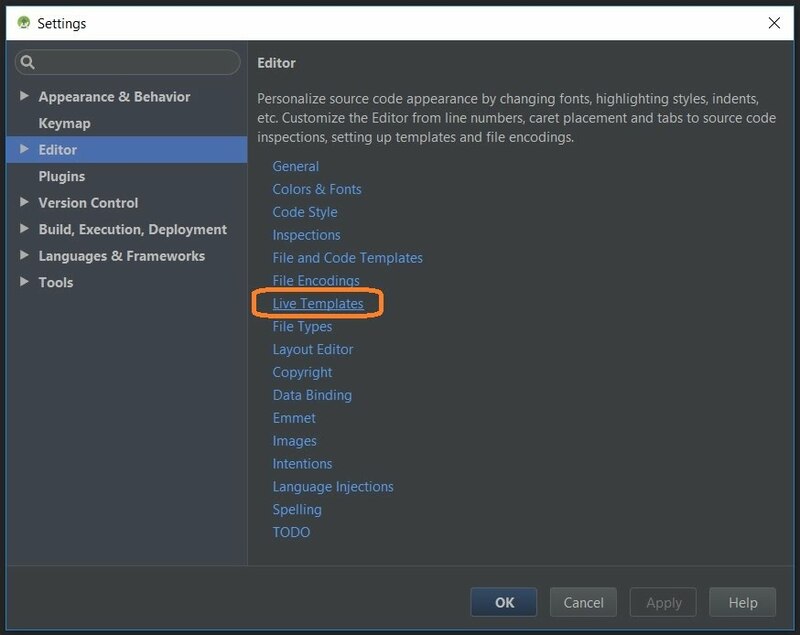 Open the App class so that we can add codes saved earlier as Live Template. Just delete bellow code. Type abbreviation that we set previously; in this case DA and press TAB on the keyboard. You should get the code as bellow picture. As in above picture, blue box will popup to resolve missing import. Just press ALT + ENTER until they are all resolved. However DaggerAppComponent (line 14 in the picture) will not resolve. Dagger has to generate DaggerAppComponent class. For this to happen we need to move AppComponent interface to its own file. To do this cut bellow codes from your App class. Create a new interface and name it AppComponent. We will not need AppComponent code generated in this file. Simply delete and paste code that we cut in above step. Use keyboard shortcut CTRL+F9 to make the project. After make is completed, DaggerAppComponent in App class should be successfully resolved. Create a TestService Class and Inject it to MainActivity for testing. Use bellow code for TestService class. Take note of the @Inject decoration usage. TestService constructor will be called when it is injected into MainActivity class. And implement codes as in bellow picture in exact order as highlighted. Bellow codes for copy paste. If everything is done correctly, we will see bellow screenshot when the app is run. 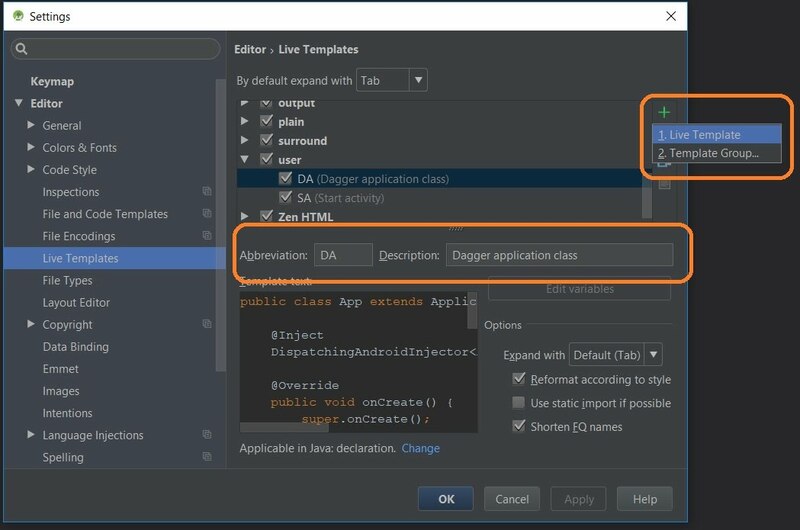 It takes 5 minutes or less to start using Dagger 2 when utilizing Android Studio Live Template functionality. Much faster to just clone the code from https://github.com/HarisHashim/QuickDagger ;) .